Here are a few viewer comments about The Traveling Trio. We'd love to hear what you think about our episodes and presentation. 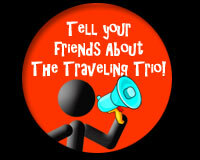 Please send your comments to info@thetravelingtrio.tv. The Traveling Trio is an adventurous, fun and informative series that will inspire you to book your next family trip as soon as possible. In this excellent series, three siblings are the "Traveling Trio" who introduce different countries and cultures. Olivia, the eldest, and her twin brothers, Everett and Ingram, narrate their adventures. Each location is introduced with a map. Viewers then travel with the children to visit specific sights, learning something about the history, geography, flora, fauna, arts, culture, currency, and foods of the region. Foreign words and location names are defined and presented both orally and visually. This is a happy jaunt with the preteen hosts trying new foods, making friends, learning phrases in foreign languages, and exploring kid-friendly locations and activities. Big Red Hat Kids (our YouTube.com channel which includes TheTraveling Trio) was selected as one of The 20 Best YouTube Channels for Kids by socialtimes.com. This excellent family-friendly Budapest travel video was made by the Big Red Hat kids and it is so cute with three kids showing Budapest, Hungary – very good video, I really really loved it, so I warmly recommend it to all travelers who have not been to Budapest yet. I especially recommend it to mums and dads who are planning to take a trip to Budapest with small kids and wish to see family-friendly Budapest programs in a video summary!!! It’s a great walk-through of some of the top attractions and events you may wish to enjoy yourself. the video quality is also very good: cuttings, music, the kids in the vid clips, the guest vid clips are superb. the video is authentic, funny, and you really feel the kids had been exploring the city! Can you imagine a better way to really make a cultural trip interesting to kids? Our family watched every one of your episodes at least two time last school year. In the spring we traveled to Sweden and Norway. Although we had been there several times before, your show inspired me to search out and plan activities that were for kids. All the planning really paid off! We have wonderful family memories and learned a lot about the countries we visited. Thank you for such a wonderful show! I am a teacher with a school called Classical Enrichment Education. Through an art education group I was introduced to your amazing website. So of course I had to share your show with my students. In class when my students are finished with classwork they beg to watch your segments. Thank you for providing wonderful information and travel highlights to places we all wish to visit someday! We have been enjoying The Traveling Trio! My husband says it's his fav new show and now I really want to go to Croatia because of you guys ! So, thanks for the episodes. Beautiful﻿, Beautiful children~ I wish they'd retain their child-like view of the world all through their lives As they say, "Growing old is inevitable, growing up is optional..."
Jezkoviii zraky !! !su uplne﻿ krasni :) Guys, you are amazing!!!! It's fantastic propagation of our small historic town (Trenčín). The best i've ever﻿ seen. Thanks a mil. Oli, this video is amazing. You are a very good speaker, your phrasing is very succinct and easy to follow. I have learned so much. I am very impressed by the overall quality of this video. Thanks for sharing. I live in﻿ Trenčín :) It's beautiful city and this is beautiful video! I love Oliart! She's younger than me but﻿ she's like my role model!!!!!!! :D And by the way, my name is Olivia too!! I really enjoyed seeing your tour of Croatia. You kids are just great!!! I just watched the Budapest episode of the Traveling Trio and think what you guys are doing is absolutely wonderful! As someone who was raised on travel I think it is such an important part of the out-of-classroom education. Can you BELIEVE these kids??? OMG, you are GREAT!! You are amazing! I'm SOOOO impressed! Can you imagine where you'll be in a few years??? I'm proud of you! Keep 'em coming! I absolutely LOVE watching these "productions" --- you kids are getting a tremendous education and some valuable experiences --- I only wish I could join you in some of the traveling. I think you rock. The production was great, you were not only clear but very fun to watch and create with. You have a career﻿ here I think. The production was very WELL done and you are so comfortable in front of the camera. The site is very cool, and the kids seem so natural explaining stuff. They come across as interested kids who like what they're doing. Very refreshing! This is such good material for children to watch. I hope you will continue producing this kind of entertainment for all ages. I discovered your web site yesterday and found it very interesting. I like the idea of the Traveling Trio. Awesome kids' series. My kids were hooked! I'm going to spread the word to some friends. Love the web site! Brilliant!